Jill Duggar and Derick Dillard celebrated their impending arrival on Sunday with family and friends at a local Olive Garden; the couple also posted a photo of themselves with their mothers and the growing baby bump. Jill and Derrick will welcome a baby boy this month, just months before their first anniversary. They learned they were pregnant just months after returning from their honeymoon and have spent the past nine months enjoying every moment of pregnancy and posting plenty of photos and advice for moms- and dads-to-be. "Thank you @OliveGarden and Derick's church family for the baby shower today! We were so blessed! #babydilly #OliveGarden #baby shower," Jill captioned a photo on her Instagram. On Friday, Derick posted a photo of himself, his wife, and their own moms lovingly touching Jill's baby bump. He excitedly captioned the photo, "Hanging out with the grandmas! #bestgrandmas #37wks." 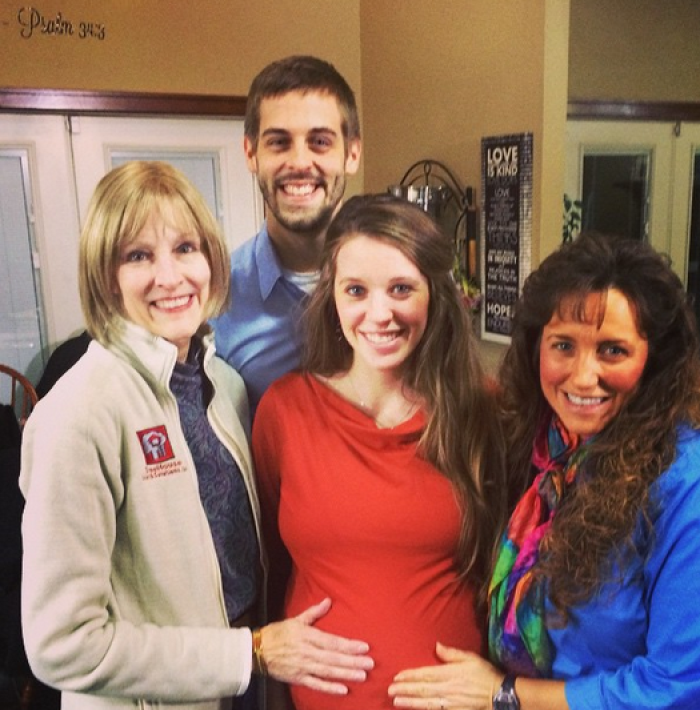 The couple is planning to have a home birth, which is not unusual for the Duggar family. Son Josh and his wife Anna welcomed their first baby at their home, with help from midwives; matriarch Michelle Duggar was present for the birth as well and will be for Jill's birth. Sister Jana will assist in any way necessary, and Jill is a midwife herself, so there will be plenty of help available. "We're getting the birthing pool, things like that," Derick told People. "We have a bassinet and a crib." While Jill has plenty of years of taking care of younger siblings under her belt, Derick only has one younger sibling and has admittedly not changed any diapers just yet. He jokingly told People that he was looking forward to them both changing their first diaper. And at the baby shower, he received a book on parenting as well as a onesie in blue with the phrase, "You can do this dad" on it. The birth of baby Dilly will either air in a TLC special or be featured in the upcoming season of the hit series "19 Kids & Counting."